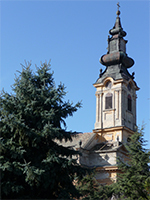 Vrbas (German: Werbass) is located in Bačka and was first mentioned in 1387. After the end of the Ottoman Rule in the 18th century, the region was resettled and turned into a multi-ethnic community of Serbs, Germans, Hungarians and Ruthenians. After the establishment of the grand Bačka canal and the opening of the railway line between Budapest and Zemun, the city’s economy flourished and Vrbas turned into a centre of industry, craftsmanship and trade in the 19th century. At the same time, new primary schools, a school for craftsmen and a high school were opened. During the time of Josephinist settlement, protestant colonists founded Novi Vrbas (German: Neu-Werbass). The settlement was largely populated by Germans which had come to the region from Pfalz, Württemberg, Hesse, Alsace and Saarland in the mid-18th century. At that time, Novi Vrbas had 252 households with mostly protestant inhabitants. The first German secondary schools were established in 1918. First, they were protestant schools initiated by the church (1918-1920), but later turned into state schools. In the interwar period, Vrbas became a unique centre for teacher training and an identificatory place for the Danube Swabians. 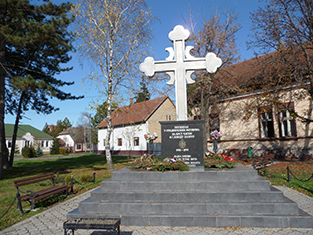 The German population erected a monument commemorating the colonisation of Vojvodina. Apart from the German bourgeoisie, Vrbas is also known for the famous German artist Josef Pechan (1875-1922) who was an important representative for modern painting in the region. 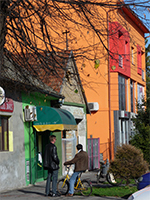 RIGHT: City life in Vrbas.